Syrian President Says He Would Pursue 'Terrorists,' Even With A Truce : Parallels Bashar Assad claims more than 80 countries are supporting extremists in his country. He says he would welcome a pause in the fighting, but would still attack groups like ISIS. Syrian President Bashar Assad speaks during a Dec. 11 interview in Damascus with the Spanish news agency EFE. In his latest interview, he blames foreign powers and "terrorists" for the country's civil war and says he still hopes to put the country back together. In an interview, Syrian President Bashar Assad accused more than 80 countries of supporting terrorists in Syria, and he said he wants to go down in history as "the one who saved his country." Assad spoke to a reporter for Spain's El País newspaper, who traveled to Damascus and filmed the interview on Saturday inside a residence there. El País said the visit took place amid heavy security measures. The newspaper posted a video excerpt and transcript of the interview on its website. The Syrian president's comments come amid attempts by world powers to broker a pause in the fighting in Syria. The U.S., Russia and others hoped for that to occur last Friday, but the violence continues. Media reports on Monday said they were now aiming for a deal by Saturday. However, that would require agreement from the warring parties in Syria. Any deal would not include ISIS and the Syrian al-Qaida affiliate, which could still be attacked. Assad said the Syrian government is willing to respect a truce, but he continued to maintain a list of conditions — including reserving the right to attack factions he calls terrorists. "It's about stopping the fire ... but also about preventing the terrorists from using the ceasefire or the cessation of hostilities to improve their position," Assad was quoted as saying. "It's about preventing other countries, especially Turkey, from sending more recruits, more terrorists, more armaments." Assad uses a broad definition of "terrorists" that includes all armed factions opposed to his government. Turkey and the U.S. back some rebels that they consider moderate. On the video, the Syrian president was asked about photos of a 3-year-old Syrian boy, Alan Kurdi, whose body washed up on a Turkish beach last year. His death focused international attention on the plight of the roughly 5 million Syrians who have fled their homeland. "This is one of the saddest parts of the Syrian conflict, to have people leaving their country," Assad replied. The Syrian government itself has been widely blamed for acts that have driven the refugee flow, including chemical gas attacks and the widespread use of indiscriminate "barrel bombs." Rights groups say Assad's forces are responsible for the vast majority of civilian deaths in Syria. Next month marks five years since the start of demonstrations that grew into the Syrian civil war. More than a quarter-million people have died in the conflict, according to the United Nations. The Syrian president said that Russian and Iranian support have been "essential" for the Syrian army. Asked about civilian casualties from Russian bombardment, Assad denied any such incidents. However, human rights groups and residents in northern Syria said Russia was involved in the bombing of several medical centers last week. The residents and the U.N. put the death toll at around 50 civilians. "We don't have any evidence that the Russians attacked any civilian targets. They are very precise in their targets," he said. Assad denied that his regime is holding any opposition leaders in prison. "All of them left [prison,] including some who were terrorists," he said. However, a U.N. report this month detailed torture and death on a massive scale within the Syrian government's prisons. It found tens of thousands of people are detained at any one time, and that state agencies co-operate to cover up killings. Almost half of 500 former prisoners interviewed said they witnessed a death in custody. The same report found that extremist groups in Syria — ISIS and Jabhat al-Nusra — also killed detainees, though not on the same scale, and that other opposition groups for the most part do not systematically abuse prisoners. Assad went on to say that if his army could regain control of the whole country, he would like to form a national unity government, write a new constitution and hold parliamentary elections. As for where he sees himself in 10 years, Assad said: "If Syria is safe and sound, and I'm the one who saved his country — that's my duty." "I don't care about being in power. 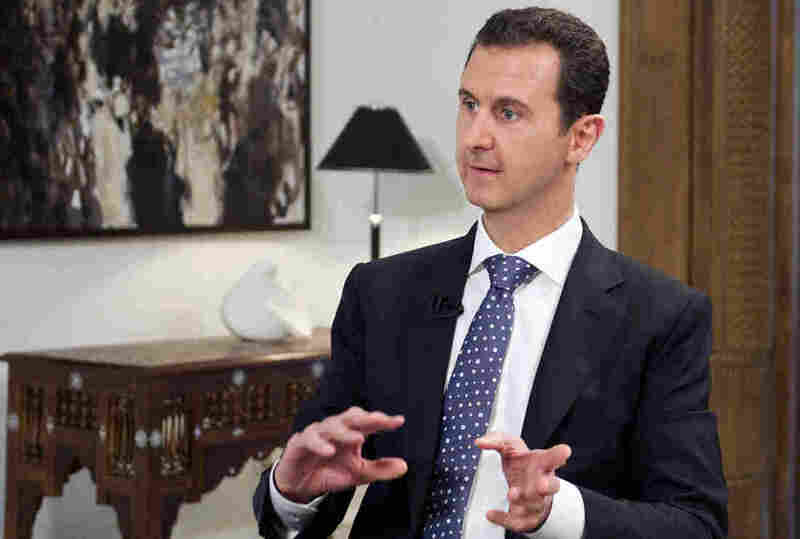 If the Syrian people want me to be in power, I will be," he said. "And if they don't want me... I have to leave right away."